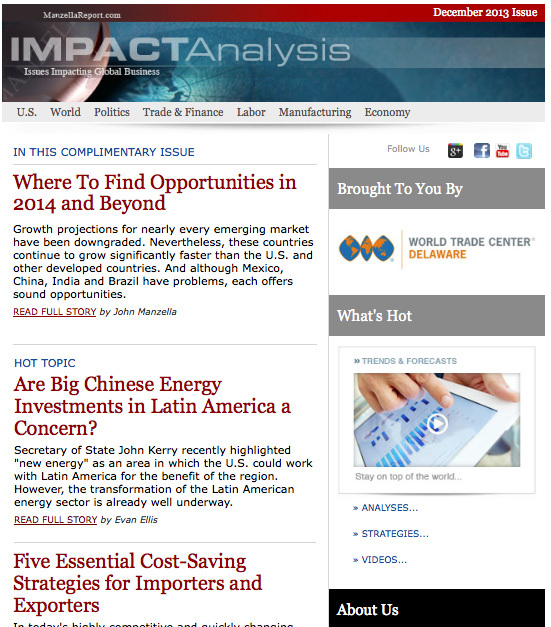 Impact Analysis, our flagship newsletter, features issues impacting global business and today's new economic realities. It is private labeled by world trade centers, state chambers of commerce and other organizations, and distributed via email to their respective audiences. Impact Analysis serves as an effective, value added benefit for these organizations by offering quality content and in-depth analysis written by industry experts. This gives private labelers a competitive advantage, optimal exposure and credibility in their respective markets. View Impact Analysis (top half) at left or our latest issue housed on The Manzella Report. Each month we place the top six articles, along with each private labelers name, logo and other details on a customized HTML newsletter template, which is provided to private labelers for their distribution.